The Egnatia Observatory was examined by the research institute NordRegio as a case study of the implementation of the ESDP (European Spatial Planning Perspective) in the context of the ESPON (European Spatial Planning Observatory Network). The English version of the website contains a subset of the information available in the Greek version. 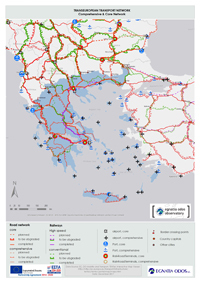 The Egnatia Motorway is a Trans-European Transport Networks (TEN-T) priority project. It represents a major investment in the transportation infrastructure of Northern Greece assisting the development of the region specifically and SE Europe in general. Both the importance and the size of the investment necessitate the promotion of actions supplementary to construction that would multiply the benefits and mitigate the impacts from operation. EGNATIA ODOS S.A. established and operates the Egnatia Motorway Observatory in order to: (a) support the integrated management of the motorway, (b) contribute to the utilization of the project in the cohesion and development of Northern Greece and the greater area of SE Europe, and (c) contribute to the harmonized assessment of impacts of Trans-European Transport Networks on the cohesion of the European area. • the quality of the environment. 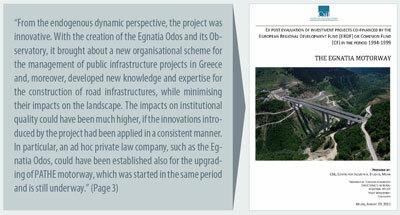 Through the Observatory, EGNATIA ODOS S.A. takes cares of the assessment of spatial impacts of the Egnatia Motorway and vertical axes system in relation to the project implementation progress, i.e. in relation to “before” and “after”. In this way the impacts on the social and economic cohesion shall be determined, as well as on the territorial planning, the transport system, and the environment in Northern Greece. The results, reports, and generally the material produced by the Observatory is supplied to the public and interested agencies over the Internet and through leaflets, events etc. 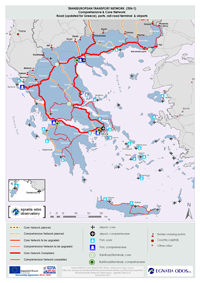 The objective of the Egnatia Motorway Observatory is to collect and process data, and calculate indicators to be used for monitoring the long-term impact of the motorway on the social and financial cohesion, the physical planning arrangement, the system of transport, and the environment. The Observatory is being developed as a strategic tool providing information and support to policies and programmes of development planning, at the service not only of the EGNATIA ODOS A.E. but of all Regional and National Authorities and development agencies of the greater impact area of the axis.  Produce direct and continuous output on an annual basis.  Promote the cooperation and networking with similar organizations both at a national and international level, as well as with developmental agencies in the wider impact area of the motorway. The Egnatia Motorway Observatory is the only Greek Observatory of Transports with a permanent organization and operation. It is a Unit of EGNATIA ODOS A.E. under the Support Services Division. By creating the Observatory and incorporating it in the existing structure of EGNATIA ODOS A.E. the maximum possible compatibility and complementarity with the other activities of the company is achieved, and at the minimum possible cost, as the existing human resources and equipment are utilized in a more rational and effective way. for anti-spam reasons, please replace the word "at" with the symbol "@"
Design and Development: Observatory Unit, Egnatia Odos S.A.
FOR THE PERIOD 2010-2015 THE EGNATIA ODOS OBSERVATORY WAS FUNDED BY THE OPERATIONAL PROGRAMME "IMPROVEMENT OF ACCESSIBILITY 2007-2013", "TECHNICAL SUPPORT FOR THE PRIORITY AXES OF THE COMMUNITY SUPPORT FRAMEWORK"